Looking to buy safety vests in Rochester NY, Ithaca NY, and Western NY at competitive prices & with exceptional service? 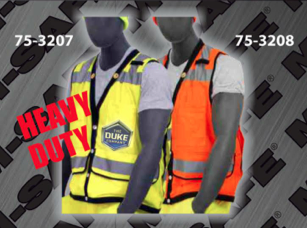 The Duke Company proudly carries the finest Safety Vests – ANSI Class 2 Vest – Heavy Duty Snap Front in both High Visibility Orange and High Visibility Yellow. Excellent breathability on hot days. Edges that are reinforced with heavy trim. Essential rear pockets for holding project plans and large sized documents. Available in High Visibility Yellow and High Visibility Orange.